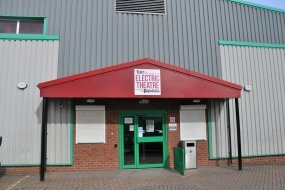 The Electric Theatre is a vibrant theatre complex situated in the heart of Barnsley and includes two dance studios, classrooms and a 180-seat theatre with specialist infrastructure. Located close to the bus and train station the theatre hosts curriculum based performances by our students and some external performances. A variety of shows can be seen from music performances, drama, musical theatre, dance and variety to external touring shows.